The second installment of the “What’s it all about series?” aims to tackle the broad utilization of in vitro three-dimensional (3D) culture models, termed organoids. There are numerous definitions for what constitutes an organoid, and just as many applications for their use. Though sometimes hard to define, the use of 3D in vitro cultures has become more of a standard as cell biologists accept that they are a more physiologically relevant system than traditional 2D cultures (see the advantages reviewed here). I aim to leave you with a jumping-off point for using these techniques in your own research and/or providing you with the necessary information to be able to hold that all too important networking conversation about this trending technique being used across cell biology. Fig. 1 Cervical cancer cell spheroid from Scott Wilkinson. The rise in popularity of this technique comes from the recently accepted view that cells do not behave in historic 2D cultures as they do in vivo. Rather, 3D culture models present a more physiologically relevant approximation of the in vivo environment. Organoids represent cells grown in specific 3D environments to create mini, simplified organs that retain some physiological function. The terms “organoid,” “3D culture,” or “spheroid” are used somewhat interchangeably depending on what cell type is used, ranging from established cell lines (Fig. 1), stem cells, or primary tissue samples. In a recent review, pioneers in organoid research Marina Simian and Mina Bissell, discuss the definitions of organoids and the historical timeline leading to the widespread popularity of these techniques. How do you generate organoids? Part of what makes organoids so hard to define is the vast range of structures that are recapitulated in in vitro 3D cultures. Scientists have been able to create many functional epithelial organoids, along with various types of gastrointestinal, brain, kidney organoids, etc. The range of successful organoid models has been comprehensively covered in multiple reviews, see a review out of Nick Barker’s lab with corresponding publications and a review from Giuseppe Remuzzi’s lab discussing their biomedical research applications. Adding to the complexity of this technique is the fact that there is no universal method for creating an organoid. The field started by culturing established cancer cell lines in 3D, usually embedding them in collagen or matrigel. This provided a different context to assay physiological function, and now elaborate 3D spheroid cultures from various cell lines have been used for drug discovery and biosensor applications. More recently, 3D culture techniques have expanded immensely, allowing for the creation of more organ-like models (more commonly referred to as organoids instead of spheroids) from two general starting points: primary tissue, either harvested or biopsied, or stem cells, either embryonic stem cells (ESCs) or induced pluripotent stem cells (iPSCs). Primary tissue, once harvested, is dissociated, either to functional regenerating units or down to single cells enriched in niche stem cells. These are then implanted in the specific 3D environment for that model. Stem cells, alternatively, are differentiated into specific cell types and then implanted in the specific 3D environment once mature enough. Multiple factors for the 3D environment specific to each organoid model must be taken into account. These can broadly cover the type of extracellular matrix (ECM) used, the cocktail of signaling factors needed for maintenance and growth, and the use of differentiation factors for stem cell-based models. Another major variation in many protocols where investigators are particularly interested in cell-cell interactions is how many cell types are present and their number relative to one another. With so many factors to consider, it is a genuine marvel that so many organoid model methodologies have been utilized successfully. What’s happening in the field now and where is it going? 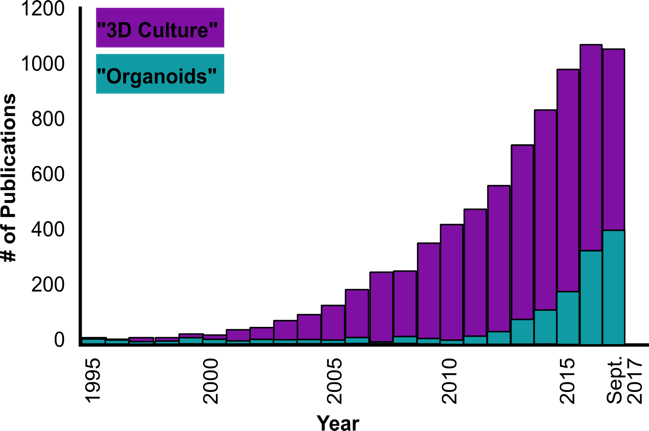 Since the late 1990s 3D culture has been gradually gaining popularity in publications with a more recent spike in the term “organoids” since 2012 (Fig. 2). Thus far we have discussed the basis for using organoids as an in vivo-like model, but what are the real applications of organoids? What is everyone using them for? The answer to this is as broad and wide-ranging as the technique itself. The studies cited by Conder showcase the incredible potential of organoid technology, but as always with new possibilities and technological advancements, come new concerns. Bredenoord, Clevers, and Knoblich discuss in a recent article how organoid technology may contribute to the existing ethical debates surrounding stem cell research and the use of animal models. What’s clear is that organoid research will spark more discussion in the future, as it becomes a gold standard technique in cell biology. Want to use organoids in your own research? With the growing popularity of organoid research, many tools and resources have emerged to guide scientists in their experimental pursuits. R&D systems provides a large range of organoid specific culture reagents but has little protocol aids. Millipore Sigma provides a nice overall review of the techniques paired with their culture reagents. STEMCELL Technologies has an organoid information hub and provides an intestinal organoid training class, as well as culture reagents and media for many types of organoids. Trevigen also provides a one-stop-shop virtual organoid research laboratory. In addition to these commercial resources, a non-profit organization called The HUB has been founded based on the work of Hans Clevers, another pioneer in organoid technology. Their website provides educational resources and outlines their living biobank project on patient-specific cancer organoids. Thinking of using organoids in your research? Take some advice from these experts who have had success using this powerful technique in a range of contexts. What are pitfalls to avoid when using organoids in the lab? Conder – As with any novel technology, researchers have to be sure to remember organoids are just that: a technology. The potential this particular technology has to advance research and facilitate the promise of precision medicine is great but still needs to be addressed in the form of well-designed scientific questions. It is tempting to try to work this culture system into a research plan, knowing that the data produced will be novel and exciting, but research still must be performed to provide answers to unknown questions and advance science accordingly. 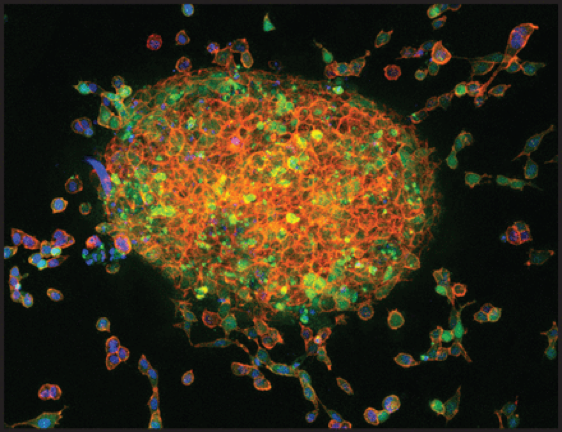 Wilkinson – With our assays using lung cancer cell lines, optimizing spheroid formation takes quite some time. Common pitfalls we would encounter would be the cells failing to come together to form a spheroid, the cell-cell contacts not being tight enough so that when we moved the spheroid to collagen it would fall apart, Trying to ensure that the spheroid is embedded in the 3D matrix and not floating on top or sitting on the bottom of the plate, etc. What did you struggle with the most in getting your techniques off the ground? Wilkinson – Identifying optimal growth conditions is challenging. When first beginning, we tried a variety of different methods for spheroid formation and growth and spent many months working to optimize the conditions. Fortunately, once you’re able to optimize for one line, others generally follow the same pattern. The process of embedding the spheroid in a 3D matrix can also be very challenging, as you’re working with a liquid matrix that will solidify in a short time. Optimizing all these conditions took our lab around 6 months, at which point we were able to expand the technique to encompass the entire lab. Sin – There was no published protocol when we started. We had to optimize every step and condition ourselves. It is a challenge to have a proper mix of the right cell type. And even if the cell type is the same, the developmental stage of the cells are influenced by their environment. So, it is important to characterize the organoid with markers that are pre-validated in an intact brain (or whatever system you’re working on). What essential advice would you give to someone just starting out? Sin – To start cheap, play with mouse neural stem cells to gain technical experience in co-culturing glioma stem cells with normal neural tissue (which will be derived from iPSC ultimately). Conder – Spend the majority of the time on the experimental design. Unlike extremely well characterized cell lines, each organoid culture will be unique to the patient or mouse donor. Make sure to understand what the data generated by the experiment is going to be used for and that the proper controls are in place to be confident in the results. Wilkinson – Patience. The technique is very powerful and provides one of the closest attempts to replicate an in vivo system using in vitro methods, but the process of developing and optimizing the assay can be very challenging and requires a lot of patience. I would strongly recommend seeking out advice from others who have done it before, especially in person if possible, so they can provide advice and guidance as you move forward with it.